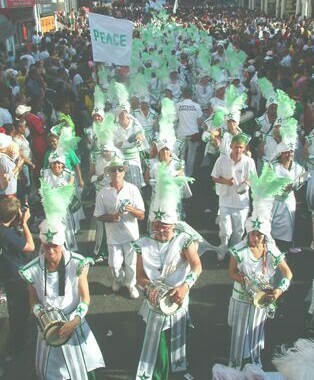 The London School of Samba has been performing to the delight of audiences for over twenty years; during this time it has participated in many high-profile events, including the opening gala of the Millennium Dome, concerts at the Royal Albert Hall and national and international festivals. 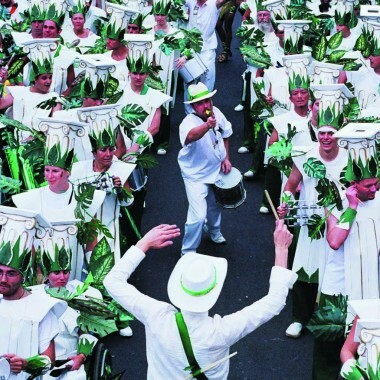 The London School of Samba consistently comes in the top ten groups at Notting Hill Carnival, Europe’s largest street festival, however its shows are equally ideal for more intimate parties and events. Whatever the scale of the event and needs of your audience, the London School of Samba will create the perfect performance. You won’t be able to resist the call of the London School of Samba. The intoxicating rhythms of samba sound far beyond the streets of Rio and the shores of Bahia, bringing the passion, colour and excitement that make Brazilian carnival so special. Get up and dance or sit back and enjoy an extravaganza of exuberance and colour! 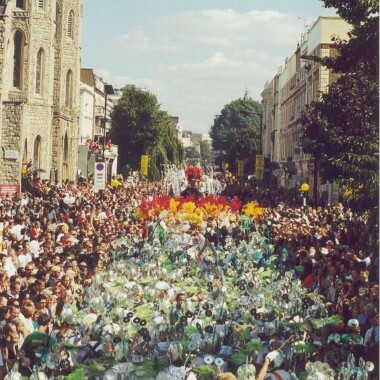 The London School of Samba (LSS) was formed in 1984 by a group of musicians with the desire to share their passion for Brazilian music and carnival arts with a wider audience; in the last two decades it has earned a reputation as one of the leading European Samba groups. The London School of Samba is dedicated to performing a range of Brazilian music and dance styles, from the fast Batucada and energetic footwork of Rio Carnival to the more Caribbean-style grooves and Afro-style dance of Samba Reggae. The LSS Bateria (drumming group) is formed around a core of skilled and dedicated percussionists; it varies in numbers from a minimum of twelve drummers for indoor events to over fifty for carnivals and parades. The LSS dancers train and perform with some of the best Samba dancers outside of Brazil and are lead by the legendary Romero from Rio de Janeiro. The Passistas, fast-stepping dancers in beautifully plumed costumes, are also joined by energetic Afro-Samba dancers, graceful Baianas and other costumed dancers for larger events. 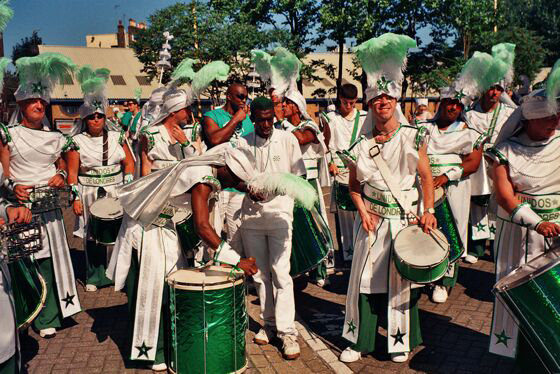 Enter the spirit of carnival with the London School Of Samba. The LSS is a charity and voluntary organisation. All proceeds from performances go towards LSS activities. These include public dance, percussion and costume-making workshops; annual participation in the Notting Hill Carnival parade and outreach projects such as the South London Boroughs initiative to carry out workshops and do performances with local Schools.